Shane has improved tremendously in the past year for he Hawks Golf Program. 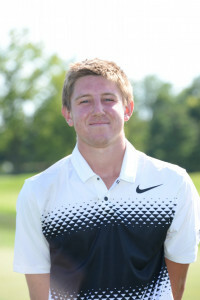 He is currently averaging 79 for 18 holes, and just shot 74-80 at the GMC Championship to earn 1st team all GMC in his first appearance in the event. During this tourney, Shane hit a HOLE IN ONE on #8 at Glenview on his way to a first day 74. “ His ace, and his 74 really spurred the team to a great first day score. Shane is the ultimate competitor and teammate. He is always trying to improve his game while also pushing his teammates to get better. “ Shane is also a member of the Lakota East Student Athlete Leadership Team (SALT). Bree led Lakota East girls at the Sectional Tournament Monday, October 2, at Walden Ponds by shooting 81. Bree finished tied for 5thoverall and helped the Lady Thunderhawks to a 2nd Place finish, qualifying the team for the District Tournament. 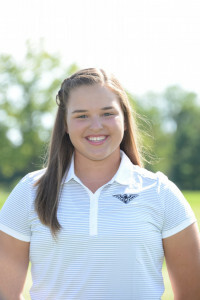 Additionally, Bree led the team with an 81 at the St. Angela Merici Invitational on September 23 at Maketewah CC, which was good for a Top 10 finish in a very deep field. Bree has been successful on the course, but is also representing the Lady Thunderhawks in the classroom. Bree is taking multiple AP courses and knocking it out of the park academically.